A light colored wood, maple has been very popular over the past ten years. Grown locally on the east coast and relatively plentiful, maple offers good looks, strength and resistance to wear. 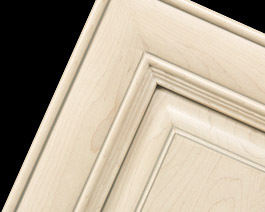 We use Hard Maple which has an innate luster and that shows through the finish. The wood has a close fine, uniform texture and is generally straight-grained, but it can also occur with “curly,” “fiddleback,” and “birds-eye” figure. The wood is hard and heavy with good strength properties, and a particular high resistance to abrasion and wear.